The Chevrolet HHR is a car-based retro-wagon that celebrates its Chevy heritage with styling inspired by the iconic 1949 Suburban. HHR stands for Heritage High Roof, a reference to the early high-roofed Suburbans and panel wagons that inspired its design. Based on the same platform as the Chevrolet Cobalt, the HHR was first launched as a 2006 model. The HHR is similar in concept to the Chrysler PT Cruiser. We found the Chevy HHR fun to drive. It isn’t a sports car, but it’s nimble and we were pleased with its acceleration. The HHR feels more responsive than its horsepower, torque, and transmission ratio numbers suggest. Plus, it gets decent fuel economy. The HHR Panel Van features smooth, windowless side panels and side cargo doors with no handles. The cargo doors open via an instrument panel button. While it’s plainer inside and provides seating for only two, the Panel best exemplifies the early Suburban heritage. The HHR SS is the most fun to drive of the HHR models, launching quickly off the line and offering sharp handling. On an autocross circuit, we found the SS model handled like a sports car. The HHR interior isn’t as functional as we’d like, however, and the base cloth fabric left us wishing we’d ordered the optional leather. The 2010 Chevy HHR comes in two body styles, the four-door Utility configuration with windows and back seats and the Panel truck with no side rear windows and no back seat. The Utility is available in LS, LT, and SS trim levels, and the Panel in LS and LT. The standard engine is a 2.2-liter four-cylinder, rated at 155 horsepower and 150 pound-feet of torque. A 2.4-liter four-cylinder engine is optional, and included as standard with the 2LT trim; it’s rated at 172 horsepower and 167 pound-feet of torque and delivers crisp, responsive performance. The SS version has a 2.0-liter turbocharged four-cylinder engine that makes 260 horsepower (250 with the automatic transmission) and 260 pound-feet of torque (222 with the automatic) and cranks out seriously invigorating performance. Each engine is available with a five-speed manual or an optional four-speed automatic transmission. The changes for 2010 are limited to three new exterior colors and a revision to the Cashmere interior color scheme. The 2010 Chevrolet HHR LS ($18,720) comes with air conditioning, power windows, power mirrors, power locks, cruise control, and a substantial level of standard features and equipment. Options for the LS include remote start, the automatic transmission ($1,000), running boards, a spoiler, and a variety of other factory and dealer-installed features and accessories. The HHR LT ($19,720) adds remote start as standard (but only with the automatic transmission), an eight-way power driver’s seat, driver’s lumbar support, and the availability of many more optional extras, including a Bright Chrome Appearance Package. The HHR 2LT adds the LT Equipment Group ($1,700), which includes the 2.4-liter engine, 17-inch chrome alloy wheels, fog lamps, running boards, FE3 sport suspension, Bluetooth connectivity, leather-wrapped steering wheel, auto-dimming mirror, and a Pioneer audio system with seven speakers and 260 watts. The HHR SS ($26,255) adds the turbocharged engine, performance handling suspension, 18-inch polished alloy wheels, SS embroidered seats, a rear spoiler, and other items. Optional on the SS is the Performance Package ($895). The HHR Panel comes in LS ($19,030) and LT ($20,030) versions. Options and prices for the Panel are the same as for the equivalent levels of the non-Panel versions. One interesting option for the LS and LT Utility versions are solid rear quarter panels ($195), which close in the rear sides and give a look somewhat between the Utility and the Panel models. Safety features include front airbags, front and rear side-curtain airbags, anti-lock brakes, Stabilitrak electronic stability control with traction control, and tire-pressure monitoring. We like the retrospective styling of the Chevy HHR, though the whole retro craze is getting long in the tooth. 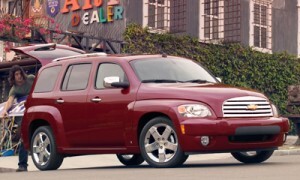 The closest comparison is the Chrysler PT Cruiser, another retro-styled utility vehicle with good fuel efficiency. The rounded nose of the HHR is not unlike Chevy’s SSR, which also reflects the brand’s truck heritage. The HHR’s fenders are well defined, with flat side wheel-well openings contrasting favorably with the vehicle’s many curved, contemporary sculpted surfaces. Front and rear bumpers and fog lamps are integrated into seamless fascia, with nostalgic integrated running boards. The flush glass all around, including the windshield, is a nice touch, as are the headlights surrounded by body panels in old school fashion. The taillamp treatment consists of two round vertically stacked lenses on each side. The large, prominent grille is chrome, (except on the SS model), and appears much like that of the 1949 Suburban. Front and rear bumpers are molded from composite material, integrated as part of their respective fascia. The Chevy HHR offers a more traditional look than other vehicles in its competitive set. It provides lots of room and functionality without being boxy. When viewed from a distance, the HHR looks larger than it really is. Examined closely, it’s compact. And you have to sit down into it upon entry and rise out of it when exiting. The HHR Panel has no side windows and cargo doors in place of conventional rear doors. The cargo doors open wide, enabling cargo access from both sides of the vehicle, as well as from the rear liftgate. The cargo doors are smooth and don’t have external handles; they are opened via a dashboard release button or the remote keyless entry fob. The large, continuous area created by the windowless cargo doors and rear panels is ideal for business logos, advertising or personalization. Side visibility is obviously limited due to the solid sides without windows; one must rely primarily on mirrors for backing maneuvers. The smooth, windowless sides on the Panel give it a cleaner, retro, more hot rod look than the standard models. The lack of windows adds security for contents inside. The HHR SS sits lower than its stable mates, but sports extended front and rear fascias that give it the appearance of riding much lower. The front fascia features an air-dam design with integrated fog lights, and the grille comes with mesh-style upper and lower grille inserts. The new rear fascia provides a cutout for a single bright exhaust tip. Rocker moldings somewhat resemble accentuated running boards. Out back, a rear spoiler is mounted above the rear glass. Body-color door handles, mirror caps and the rear license plate surround, along with SS badging on the front doors and liftgate, further differentiate the SS from the others. Inside, the Chevy HHR provides, for the most part, comfortable and functional surroundings. Included are durable, easy-to-clean cargo surfaces, a front passenger seat that folds flat for more cargo space, a 60/40 split/fold-flat second-row seat, and a multi-position cargo package tray in the rear that provides cargo security. Finding a comfortable seating position may require some effort; the problem seems to be with the contour of the seatback. Speaking of headroom, there isn’t a lot of it, in spite of the high roof. Unless the seat is in its lowest position, you might find your head brushes the headliner, and the windshield header is low for taller drivers. Cubby storage is limited. There’s a handy flip-up compartment on top of the dash and a small glovebox. The rear provides one cupholder and small door pockets. The front-passenger seatback offers a tight storage net. Side windows are controlled on the console by buttons located just ahead of the gear-shift lever, making them inconvenient to operate with ease; positioning them on the door would have been much better. Second-row legroom is not particularly generous, and kids will definitely be more comfortable than adults. The rear seat, split 60/40, folds flat very easily, as does the front passenger seat, and, since the 60-percent side of the rear seat is on the right, a long item like a ladder can be slipped in diagonally, a nice feature. The rear cargo floor flips up to reveal a five-inch-deep tray useful for storage. The rear liftgate is one piece and raises easily. The HHR Panel provides seating for two and a large, flat cargo floor with tie-down points to help hold things in place. The HHR Panel cargo area features a standard auxiliary power outlet, as well as a 40-amp auxiliary power connector to provide service for a variety of specialty equipment needs. Two large storage compartments, with a lockable option, are located forward under the cargo floor (in place of the rear seats of the passenger models). The compartments offer security for things such as computer equipment, flashlights, service manuals and other valuables. The HHR SS features a special interior with SS-embroidered sport seats with inserts, a specific gauge cluster, an A-pillar-mounted turbo boost gauge and a new shifter arrangement. Three interior color combinations are available: Ebony, Light Gray and Victory Red. The Chevy HHR offers a choice of engines, all of which offer good fuel economy. We like the optional 2.4-liter Ecotec engine. The Ecotec is an aluminum four-cylinder engine, with 16 valves, electronic fuel injection and variable valve timing. The 2.4-liter delivers 172 horsepower at 5800 rpm and 167 pound-feet of torque at 4500 rpm. The torque peak figure at such a high rpm suggests that the low-rpm pulling power might be weak, but quite to the contrary, it’s not. Faced with a steep, slow hill, the HHR worked its way upward like a tractor, with no shifting-down or searching by the automatic transmission. This high-load, low-rpm driving is what many drivers demand, and the pulling power of the 2.4-liter engine is impressive. The four-speed automatic works well. We liked the way the automatic could be easily manually downshifted, even though it doesn’t feature a separate manual mode. And we liked how it held second gear going down steep and slow hills. Acceleration is impressive. Merge onto a freeway, with the foot on the floor, and the HHR 2LT really scoots, making it a lot of fun. The 2.4-liter engine is quiet, thanks partly to specially laminated steel in the firewall. It’s also fuel efficient. The 2.4-liter gets an EPA-rated 22/30 mpg City/Highway. That’s with either transmission. Premium fuel is recommended but not required. During one week in the HHR 2LT, we averaged 23.4 miles per gallon, as indicated by the digital display on the dash. That included mostly around-town driving, plus about 120 freeway miles with a full load of passengers and the cruise control set at 70. The HHR got slightly better mileage at that freeway pace than it did light-footed around town. The best fuel economy comes from the base 2.2-liter engine, which gets an EPA-rated 22/32 mpg City/Highway. Even the SS, with its 260-horsepower engine and manual transmission, delivers EPA ratings of 21/29, City/Highway. The 2LT has a sport-tuned suspension with 17-inch aluminum wheels. There is no harshness to the ride around town, or over freeway bumps for that matter. The HHR is nimble, though the suspension shows its limitations when driven like a sports car. Chevrolet said it put a lot of time into the calibration of the rack-and-pinion steering with power assist, and we would say it feels just right around town. Brakes are discs up front, drums in the rear, and have an easy feel. The SS has four-wheel discs. ABS is standard on all models. The HHR SS features a 260-horsepower 2.0-liter turbocharged and intercooled Ecotec four-cylinder engine with either a five-speed manual or four-speed automatic transmission. The SS rides on performance tires, mounted on 18-inch polished alloy wheels, and the FE5 performance suspension was tuned on the famous Nurburgring track in Germany. The suspension includes specific stabilizer bars, spring rates and shock absorber tuning, all of which were designed to complement the turbocharged powertrain. We drove two SS models, one with a manual gearbox and Brembo brakes and the other with an automatic, in and around Phoenix as well as on an autocross course and the road course at Firebird International Raceway. In all cases, it handled everything thrown at it in superior fashion. It really gets going on acceleration, has very powerful brakes, handles as well as many sports cars, and at a bargain price, while managing to deliver remarkably good fuel economy. Our preference was for the manual gearbox and Brembo brakes. The Chevy HHR is a practical cruiser that lends itself to personalizing and customization. It is a nostalgic hauler for people who want something different, and who appreciate the classic looks of the 1949 Chevy Suburban. It’s available with three different Ecotec engines, depending upon the model. It’s not designed for off-road driving or even serious winter weather, however. Its 57.7 cubic feet of cargo space doesn’t lead the class, but the fact that the seats may be folded flat increases the utility. In the end, it’s all about styling preferences. Obviously, the HHR Panel is a lot roomier with its lack of rear seats.